By building a weather application, you meet a certain demand. What kind of demand and why, you may ask? It's pretty clear! Let's honestly admit: the weather greatly affects our life. Wherever we are now - in the city, on vacation, on a business trip - in any case, we need to know what to expect: rain or snow, heat or fog. And since we don't have the gift of prophecy, we resort to the help of relevant services to obtain current weather data, which explains the growing demand for programs of the sort. Do you want to meet this demand - and, of course, get your profit? You have every chance! However, don't forget that the idea isn't brand-new, and you'll have to do a lot of work to make your weather data application profitable and successful. In our article, we’ll describe in detail how to create a weather app. We hope our tips would help you find the way to avoid the most dangerous traps and pitfalls. First of all, what's the weather app? The answer is quite simple: it's a service which tells its users what weather they should expect in the next few hours, days, weeks. And the more accurate the forecasts, the more beautiful - the interface, the more likely the program will surpass its competitors. Speaking of which… who are they, your competitors? You should know them to find out how to create a weather app able to exceed users’ expectations in the best sense of the word. Fortunately, we're ready to say who you should fear first. built-in map allowing users to monitor the weather in a particular region or a specific country in real time. To implement such a feature, you have to know how to make a weather app show the current location. Wear OS and watchOS support. AccuWeather is free, but you have to pay for disabling advertising. And one more important point: besides the application, AccuWeather offers an API so that developers can make a weather app without any trouble. However, it's too early to discuss the issue, let's study it in detail when we deal with weather forecast API providers. 1Weather is a very popular weather checking app which provides all the necessary data in a convenient and appealing way. All 1Weather features are available in a free version, and after spending $ 0.99, you can get rid of ads. Now we’re talking about one of the most accurate weather applications. It is incredibly popular in the countries of America and Western Europe. compatibility with any type of device. It’s a beautiful weather tracker app able to adjust the background of the lock screen to what's happening outside the window. smart notifications on sudden hurricanes, storms, and avalanches. If you're interested in weather app development, pay attention to ‘Yahoo! Weather’ which is certainly one of the most appealing services of our list. ‘Yahoo! Weather’ downloads great photos from Flickr and automatically chooses backgrounds matching the user's real-time situation (his daytime, location, rain or snow, etc). It looks really impressive. The application is free, but there is advertising. RANE ° is an ideal choice if a user prefers minimalistic mobile weather apps for Android and iOS and isn't fond of abstruse information about dew points, absolute humidity, etc. CARROT Weather is a professional weather app created with humor. Regardless of the outside conditions, the application will try to inflame the user by making sneering comments. Of course, such an approach isn’t everyone's cup of tea but there are amateurs who don’t mind jokes of the sort, and the service is in demand. special tips following which the user can explore the moon surface or study the fairy worlds of Mordor or Tatooine on the map to find out what the weather is there. In short, you won’t be bored with CARROT Weather. Especially since it is free. Okay, you’ve figured out your competitors, but what’s now? What should you do to make a weather app, and make a good one? Obviously, you need to obtain weather forecast data for your app! We advise that you take advantage of professional sources which allow developers to get the information about the meteorological conditions they’ve gathered. There are a great many these sources, but we’ll discuss only the best weather forecast API providers. The Weather Company has its own mobile service focused on users who are interested in knowing meteorological conditions. But the company doesn't disregard third-party developers willing to create weather apps and offers them several API packages. What to choose depends on the specific situation and task. The Weather Company has a huge number of own meteorological stations, so the task of obtaining necessary data is being simplified. Openweathermap API is another good option if you want to know how to make a weather app in a simple way. By the way, lately the module actively supports the export of meteorological data from its own weather stations. As you might remember, we've already discussed AccuWeather and mentioned that the company also provides developers with an API for building a weather app. We promised more details later, and now we're ready to offer them. And that's not all yet! 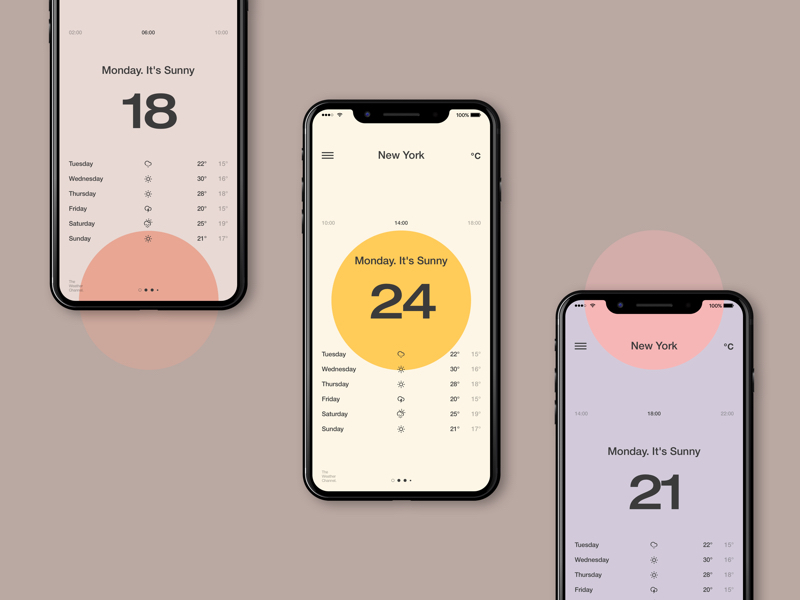 There are many more opportunities which those who are interested in the weather app development would find quite exciting. 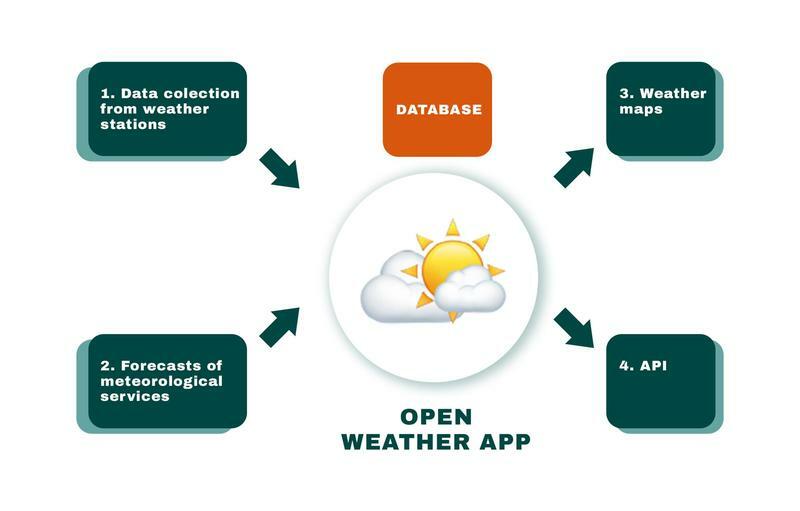 If the above options don't suit you, build a weather application with Foreca API, which grants quality forecasts in different areas around the world. Current conditions, namely, the newest measurements from official meteorological stations in all parts of the world. Artificial forecasts. Foreca Nowcasting technology solves the problem of the lack of stations (this sometimes occurs, alas). Its essence is the ability to artificially predict (using the available data) the possibility of rain, heat, snowfall, and other things of the sort. Forecasts for different time intervals, starting from 15 minutes and ending with longer periods. DarkSky is one more good option to create a weather app on Android or iOS. dozens of languages and numerous units of measurement. DarkSky also provides access to Skycons - a cool set of animated forecast icons. It's not enough just to build a weather application. You should make it as effective and helpful to the user as possible. So, it's time to discuss the optimal functionality of your service. weekend forecasts (so that users’d be able to think over their weekend with the weather conditions in mind). interactive maps. Travelers will be happy to use the map to find out the conditions in the country they’re going to visit. smart notifications: rapid alerts of meteorological weather changes, hurricanes, earthquakes storms, etc. hyper-local forecasts. Of course, you cannot ignore such a significant feature either. Take care of it when designing a weather app. visualizations and animations. Obviously, we are talking about the visualization of our forecasts. An animated weather app is perceived by the audience in a much better way. But to create weather visualizations, you should hire expert designers who know all about efficient UI/UX. integration with social networks. The feature is obvious, but beneficial to both parties: users would be happy to share their impressions of experiencing a good weather app with friends, and you'll get a free promotion. An extended features set is important but you still have to manage to beautifully present it. In other words, take care of the weather app design. It should be something enchanting and memorable… something unique! We’ve picked up a couple of excellent concepts and invite you to take a look at them. A UI/UX designer from China created a very cool app concept. This one, created by Sergey Gurov, is quite good too, isn't it? The magic weather concept by Dimest really looks magical! And this is the piece of work of our talented UI/UX designer. We hope you like it! 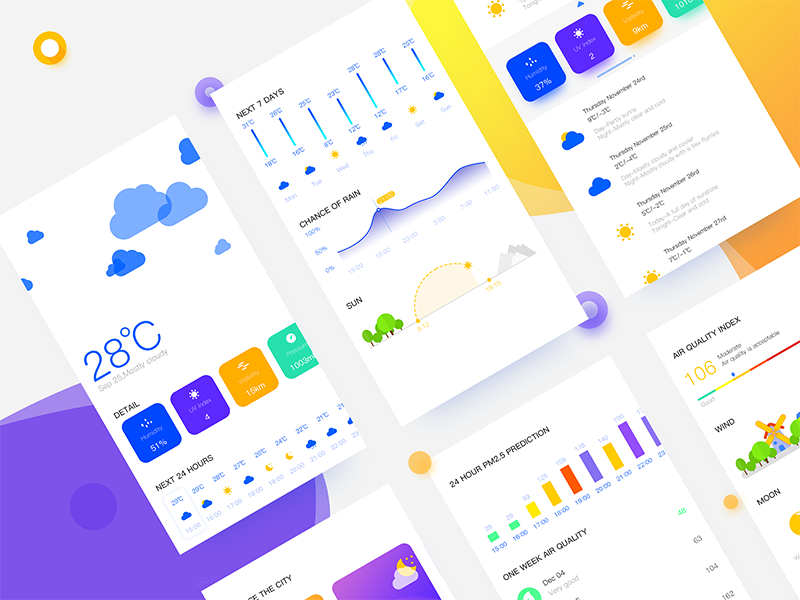 We’re sure you’re inspired by these examples and ready to make a weather app with an equally appealing design. Is it a worthy idea to build a weather app? The answer is obvious and it’s “Yes, of course!”. Why are we so sure about it? Because we've earlier listed several of your bright and very successful competitors - their example proves the profitability of the idea. But their achievements are due to the right approach to the issue. How to take up their lead? How to create a weather app and make good money on it? Idea. That is, the idea is clear - you’re striving to build a weather application. We have in mind something more specific. Say, RANE ° is, if you remember, a weather tracker app with a minimum of data, and CARROT Weather offers a humorous approach to weather forecasting. Try to find your special way to achieve the desired goal. Your target audience. To avoid being out-of-pocket, you must understand who he is, your potential consumer. What does he want? Based on these data, you should compile a list of features of a weather app. 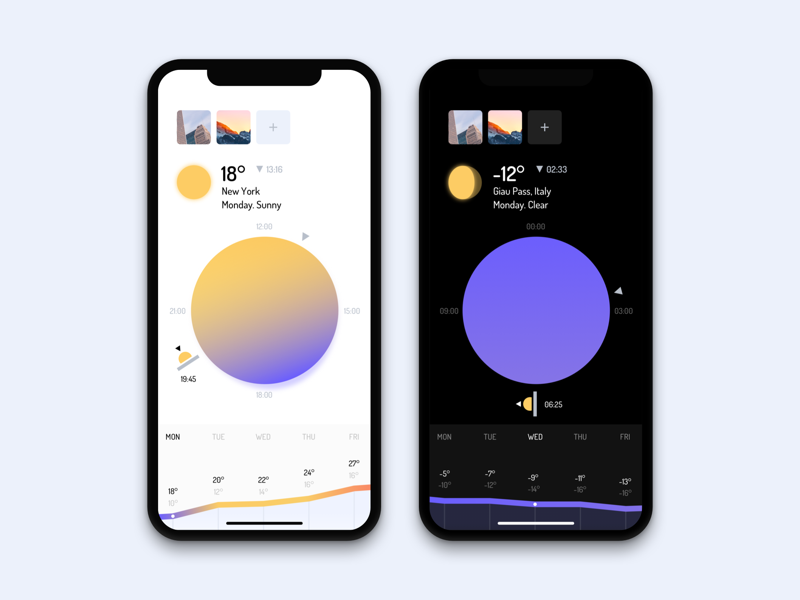 Weather app design. Have you seen those cool examples of weather checking apps created by talented designers? You need to offer something no less outstanding and vivid! Unique Selling Proposition. It’s difficult to show uniqueness by building a weather app, but you still need to try. USP is either a special feature or an unusual app design... or just a marketing trick! Anything would do - anything able to help you stand out. Monetization. To make the idea to create weather apps worthwhile, you should think carefully about monetizing your service. Most of your competitors earn with advertising - on the one hand, they get money from advertisers, on the other - from users who’re ready to pay to disable annoying ads. Besides, you can provide users with paid exclusive features. Weather app development cost. Before weather app development starts, it's significant that you have your budget analyzed. Determine how much money you’re willing (and able to) allocate for the project. support for the maximum number of devices. You need to make a weather app working with both iOS and Android platforms. qualified experts. Exert every effort to find professionals who know how to make a weather app for iOS and Android and who have relevant hands-on experience. UI/UX. Make sure the team you’ve found has good designers - a lot depends on the app interface, as you probably already understood. So, we summarize: in order to create a weather app and succeed, it's important to think through the logic of the program and develop a strategy of distinguishing from competitors. After all, such meteorological services are basic Android & iPhone weather apps, and you should do your best to attract the user. if you want to build your own weather app from scratch, we’re more than happy to help you. Our team employs only experienced and skilled specialists who'll implement your idea with pleasure and inspiration. Contact us right away, and let’s start to create a weather app together!